It's not quite April, but in happy anticipation I have a great big freebie for you. 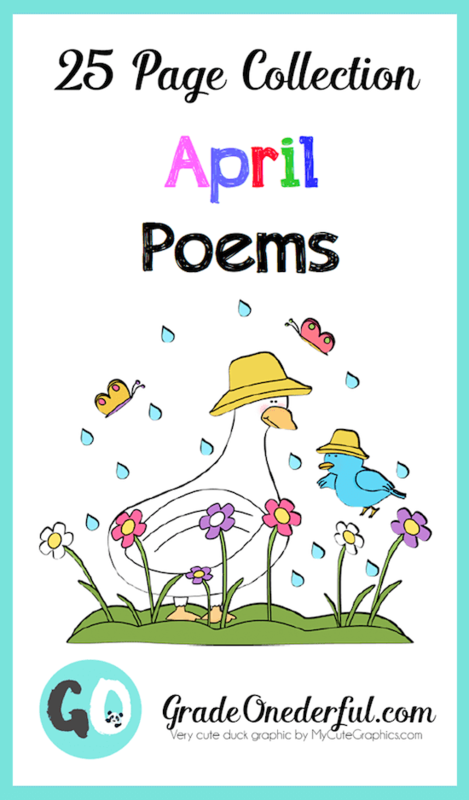 It's a collection of April poems that would be perfect in your kindergarten or first grade classroom. Every SINGLE week of the year I introduce a new poem to my students. We read it each morning, from Monday to Friday. We choral read, partner read, echo read, and read in a variety of funny voices. 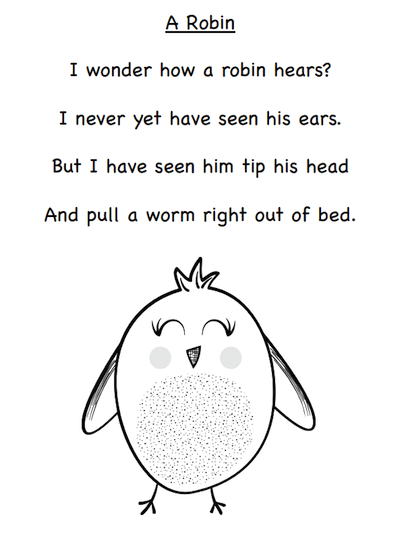 We also illustrate them, practice printing them, use them for word work and lots more! 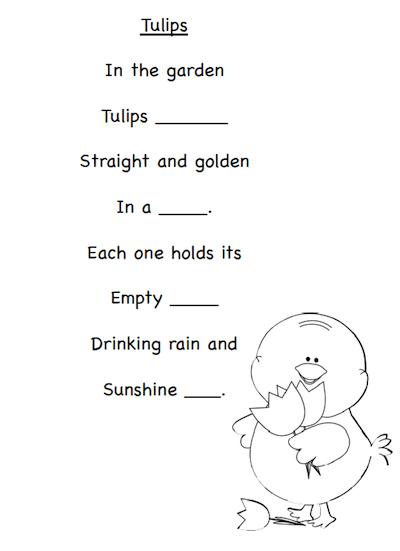 On Friday we put our poem into our poetry duotangs and they become part of our "just-right" collection of reading material. More often than not, we also have a Friday poetry theatre. That's always LOTS of fun and you can read about it here. In this particular collection there are five different poems. 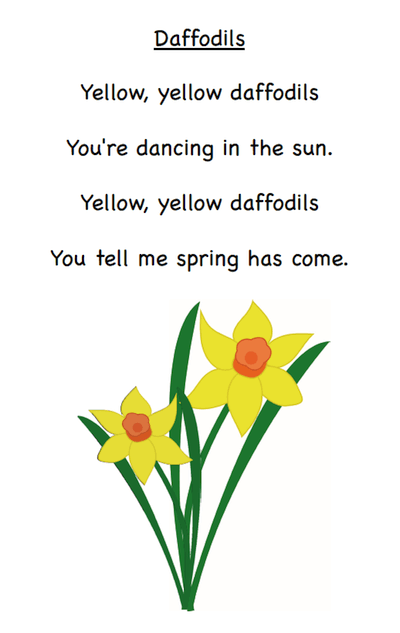 The first poem in each set is in colour. This is a great one to use with your document camera or to print at home if you're home schooling. The next one is a black and white version and is probably best for printing at school. The third one is a cloze. These are a great way to have the kids practice attending more closely to the print. And lastly, I've included a mixed up version of each poem. These are also great for encouraging the kids to look more closely at the text. All they do is cut up the lines, rearrange, and glue in the correct order. I usually have them do that on coloured construction paper and then let them take them home to practice reading some more. 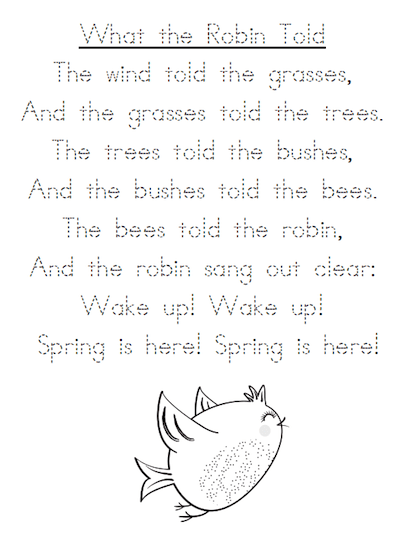 Thanks for stopping by and happy almost spring!